Children yearned for lost parents and grown men and women sobbed in raw grief on the brass bearing the names of nearly 3,000 dead as America commemorated the 10th anniversary of the September 11 attacks. The name of every person killed in al Qaeda’s hijacked plane attacks was read on Sunday in the nearly five-hour-long centrepiece of a heart-wrenching ceremony where the World Trade Centre twin towers stood, Reuters reports. There were smaller ceremonies in Shanksville, Pennsylvania, and at the Pentagon, the other sites were 19 men from the Islamic militant group al Qaeda crashed hijacked airliners on the sunny Tuesday morning of September 11, 2001. The attacks led U.S. forces to invade Afghanistan to topple the Taliban rulers who had harboured al Qaeda leader Osama bin Laden and Washington began a “war on terror” that ousted Iraq’s Saddam Hussein and persists on several fronts to this day. “Ten years have passed since a perfect blue sky morning turned into the blackest of nights,” New York Mayor Michael Bloomberg said at New York’s Ground Zero. Thousands gathered at the site on a clear morning to grieve. With security tight and no traffic, there was an eerie silence where the 110-story skyscrapers collapsed a decade ago, sending a noxious cloud over lower Manhattan. Speaking at an evening concert in Washington that closed out a day of memorial observances, Obama said much had changed for Americans in the 10 years since September 11, 2001. The ceremony in New York — with the wail of bagpipes, youthful voices singing the national anthem and firefighters holding aloft a tattered American flag retrieved from Ground Zero — drew tears. Family members wore T-shirts with the faces of the dead, carried photos, flowers and flags in an outpouring of emotion. For the first time, relatives saw the just-finished memorial and touched the stone where the names of their dead loved ones were etched. Some left flowers, others small teddy bears. Some used pencils to rub the names on paper, some took pictures, others leaned against the stone and cried. The names of the dead were read by wives and husbands, fathers, mothers, sisters, brothers and children, some choked with emotion. “May your soul finally rest in peace. Your son Nathan and I, as the years go by, grow strong. Goodbye, my dear friend, my teacher and my hero,” said Candy Glazer. Glazer’s husband, Edmund Glazer, cheerfully called his wife from Flight 11 not long before he died when the plane hit the north tower — the first of that day’s horrific events. The September 11 attacks claimed the lives of people from more than 90 countries. They were followed by al Qaeda bombing assaults in London, Madrid and elsewhere and brought an international campaign to ferret out their members. “God bless every soul that we lost,” said former New York City Mayor Rudolph Giuliani, who was called “America’s mayor” for his leadership after the attacks. The New York memorial includes two plazas in the shape of the footprints of the twin towers with cascading 9.1 metre waterfalls. Around the perimeters of pools in the centre of each plaza are the names of the victims of the 2001 attacks and an earlier attack at the trade centre in 1993. Obama visited the North Memorial Pool in the footprint of the north tower. He walked around it hand-in-hand with first lady Michelle Obama, former President George W. Bush and his wife, Laura. Obama touched the etched names of the dead before he greeted some family members. Police in New York and Washington were on high alert against what authorities called a “credible but unconfirmed” threat of an al Qaeda plot to attack the United States again on the 10th anniversary. The U.S. military said it scrambled two F-16s to accompany an aircraft flying from Los Angeles to JFK airport in New York after reports of suspicious activity, and the U.S. Secret Service said it was looking into threatening messages posted on the White House’s Facebook page. At Shanksville, Obama laid a wreath where a plane crashed after passengers overwhelmed hijackers intent on piloting it into the White House or U.S. Capitol. Chants of “USA, USA” broke out from the crowd, gathered at the foot of a grassy hill. The Obamas talked with family members. “Thank you for keeping us safe,” one man called out to the president. Later at the Pentagon, Obama placed a wreath of white flowers at the memorial, which says “September 11, 2001 9:37 AM” to mark the time the plane struck the U.S. military’s headquarters. In May, nearly a decade after September 11, U.S. forces killed al Qaeda founder bin Laden at his hide-out in Pakistan. The 2001 attacks prompted wars in Iraq and Afghanistan, where the Pentagon still has a large number of troops and where violence persists. There were moments of silence in the Ground Zero ceremony marking when the planes hit the twin towers as well as when they collapsed. 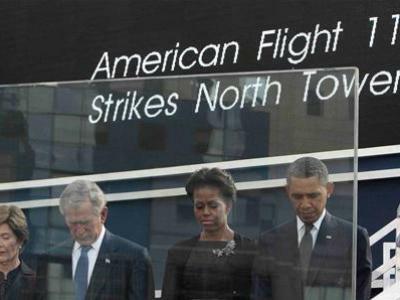 Other moments of silence were marked when the plane hit the Pentagon and the fourth crashed in Shanksville. After a faltering start at rebuilding, the new One World Trade Centre is now more than 80 stories above the ground as it rises to its planned 1,776-foot (541-metre) height — symbolic of the year of America’s independence from Britain. For many — particularly the more than 1,100 families who received no remains of their dead — Sunday was the closest they came to a funeral for their loved ones. With the memorial complete, it offered for the first time something resembling a final resting place and a formal place to mourn. “When we came out here 10 years ago there was a hole in the earth and that’s how we felt,” said Dakota Hale, 25, of Denver, who lost his stepfather, flight attendant Alfred Marchand.